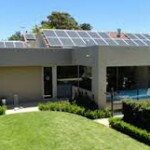 Transparent solar panels are used to replace traditional color bond roof cover, or wall, fence etc. We take the safety, aesthetics, structure and other factors into account in the design. If you want to have a new carport (even with charging interface), swimming pool fence, veranda roof, or sun house, our BIPV solution can help. Energy Cloud Australia uses its high technology based solar components to customise your BIPV system, to achieve electricity availability for agriculture, commercial and residential purpose.